The first batch is expected to be delivered to us mid November.. The obligatory diagonal angle shot. ST4 opened up, looking at the bottom plate. 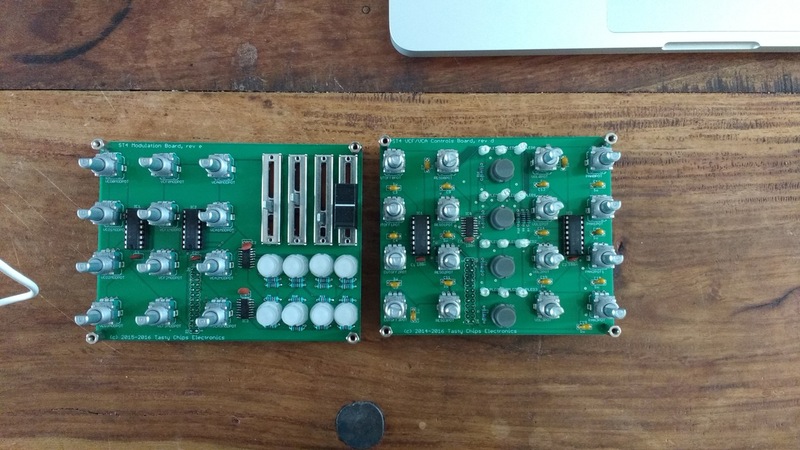 VCF board (large PCB in front), IO board for MIDI and USB, power board (with the Traco DC/DC converter). Backside of the lid. Control boards, Arduino DUE, part of the LCD display, Mic board (lower left corner). Backside of the lid. 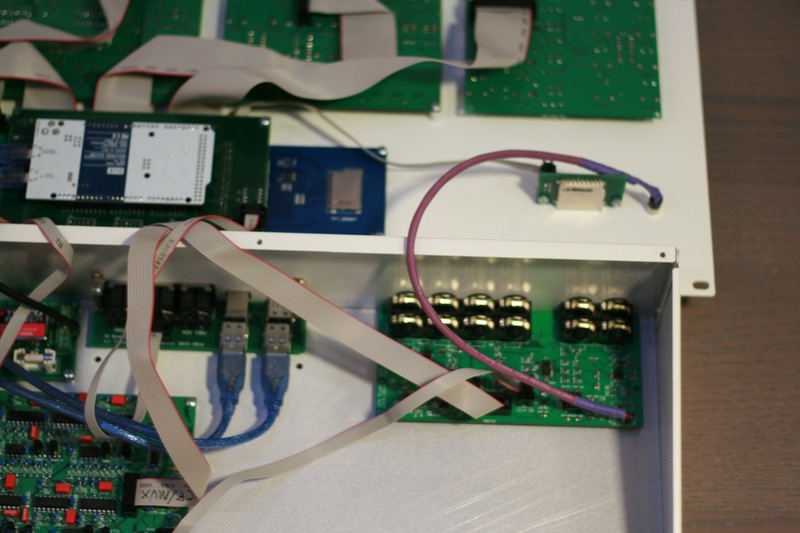 Control boards, DUE, part of LCD display, SD card board, and headphone wiring. Part of bottom and lid. The PCB with all the phono sockets is the VCA board. As you can see the lid comes off nicely and can comfortably rest on the table. No cables have to be detached. Powered on. Strutting that nice logo. This week the new ST4 sample casing arrived. No silk screen yet, but at least everything fits. Yes, this baby is rackmountable too! So, that takes care of the mechanical bits. Everything is as sturdy and tight as it gets. Now the only thing left to do are the silk screens. The designs have been finished a long time ago. We’re ordering 10 pieces to inspect the quality. 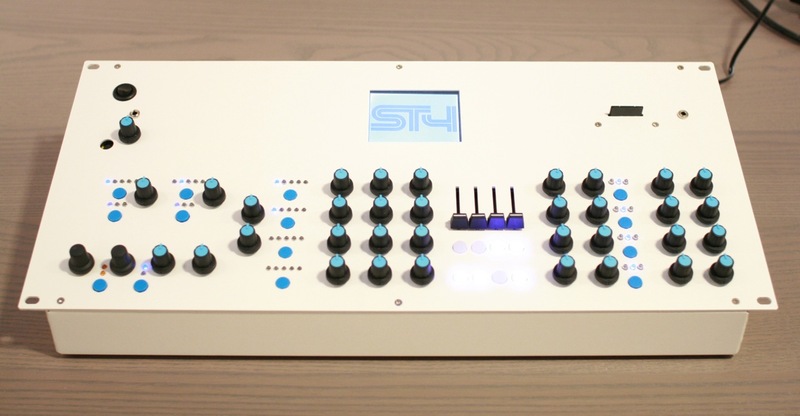 If it suffices, the first ST4’s will be shipped out early November! If not, then it will be late November/early December. In the mean time we got very little to do on the firmware. From time to time we test it and make some songs. New Sawbench: the new hardware revision is in. This means they are stocked once again: prebuilt, kit. This has built-in protection against reverse polarity (yes, those nasty guitar pedal supplies!). This is done with a miniature fuse. More details to follow. – Tolerant to MIDI clock packets. This is quite a big deal since many MIDI devices send these.. also inadvertently. – Really short attacks and releases are now possible. Just a lot better for everything staccato (can you say acid?). – Exponential envelope mode. Can be switched with CC 94. Allows for really long attacks and releases. Yet again another ST4 development update. The casing negotiations are still ongoing. To reassure you: we’re still talking to the same factory. There are just details to be discussed. We expect to have the first proof casing ready late August. When the final casings will arrive we don’t know yet. We expect late September. As mentioned before, the casings take way more time than anticipated. We will try to stick with the current factory when we start producing the next batch. 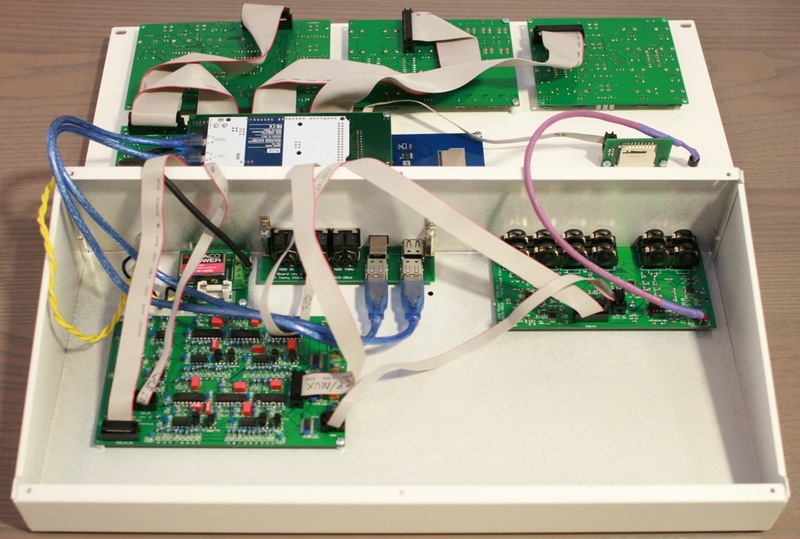 There’s other news: half of the PCB’s have now been tested. And firmware is reaching a level of maturity where controls work the same in all of the GUI screens. The GUI has become more readable, intuitive, faster and there’s an intro animation. And it looks like we’ll add spanish and french keyboard support soon. The last firmware development work involves the instrument editor. In the next weeks the firmware will grow to be able to choose from at least 100 samples on SD card. We’re also trying to get LFO settings per instrument, which is very useful to control the timbre. If that succeeds we might still go for a digital chorus per voice.. if there’s still enough CPU time left..
Another post in a long line of ST4 updates.. This is a good one. The current hardware turns out to perform very well. 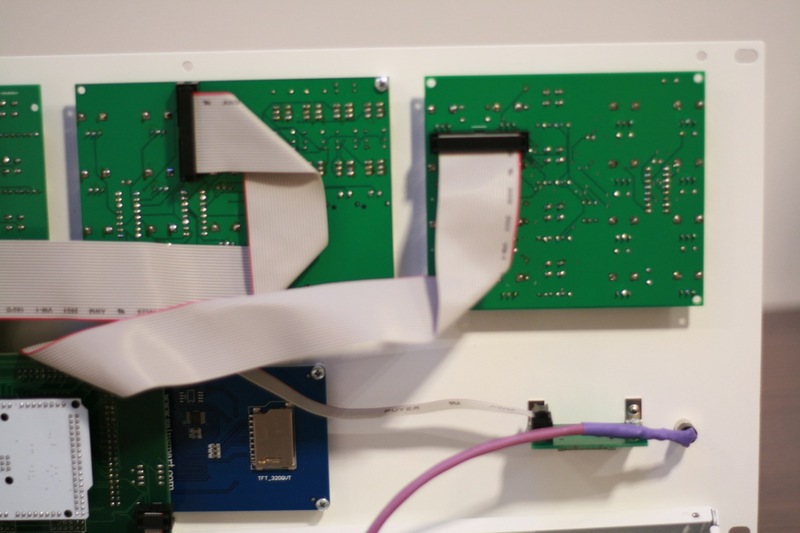 The previously tested CV generator circuit is now embedded on the so-called “expansion” PCB, which functions as the central hub between all other PCBs and the Arduino Due. The new envelope section with the sliders was implemented in the firmware is very intuitively usable, like was intended. A big step forward! 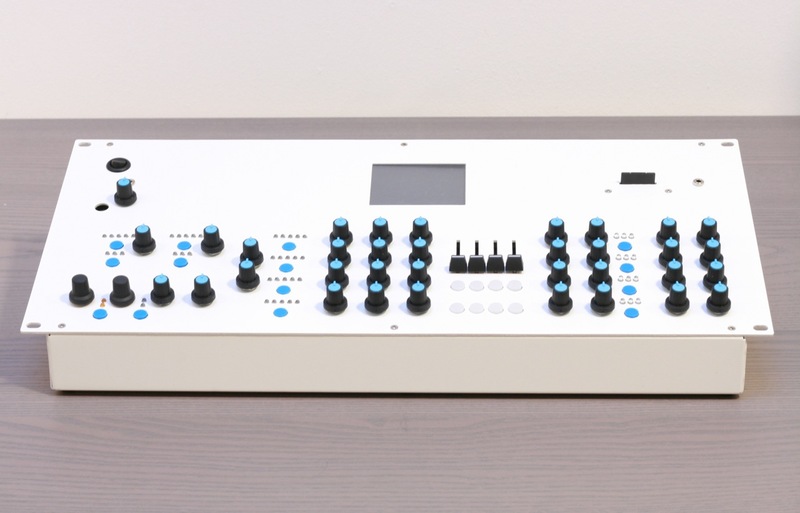 ST4 Qualification Model hardware. Highest performance yet! Top left: VCF board. Right of that is the VCA board (through-hole version). Right of that is the IO board for MIDI/USB. 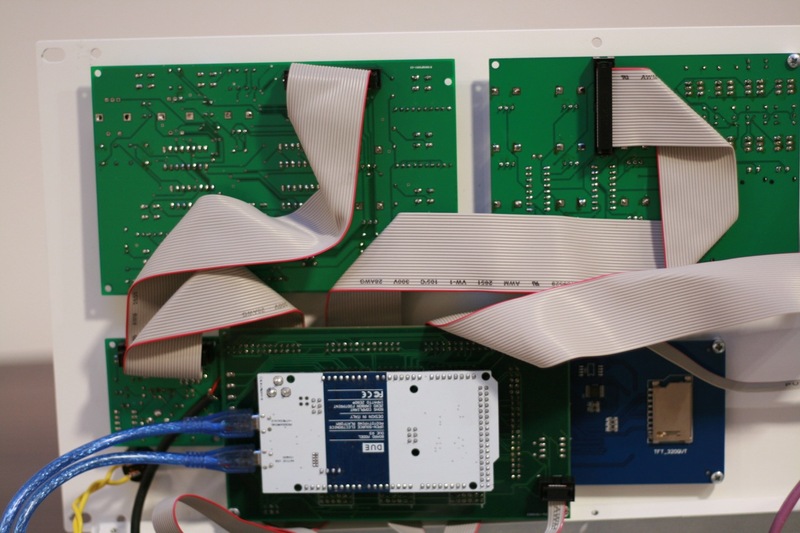 Center: expansion board. Center-right: VCA board SMD version. Bottom: all the control boards. 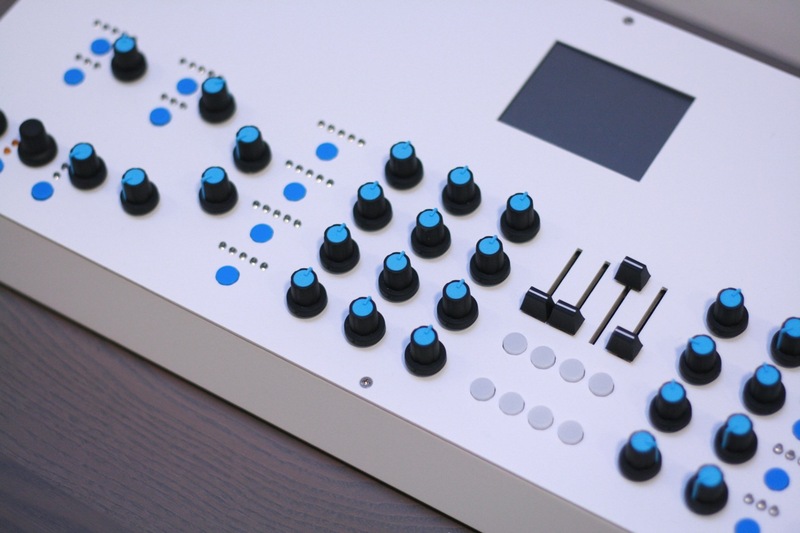 The one in the center has the new envelope sliders and led buttons..
We’ve been in discussion with some factories and have worked out a decent price for the casing. There’s also some bad news, however. The original AC/AC supply was killed off by European rules and regulations. Don’t ask! It has something to do with bogus safety or environment bs. So, that’s us over there, redesigning that power supply! What we have chosen now is an external regulated AC/DC (mains -> 12V DC) supply, with an internal switching DC converter (12V -> -12V). Don’t worry. It will be filtered, and the external supply will be region independent! 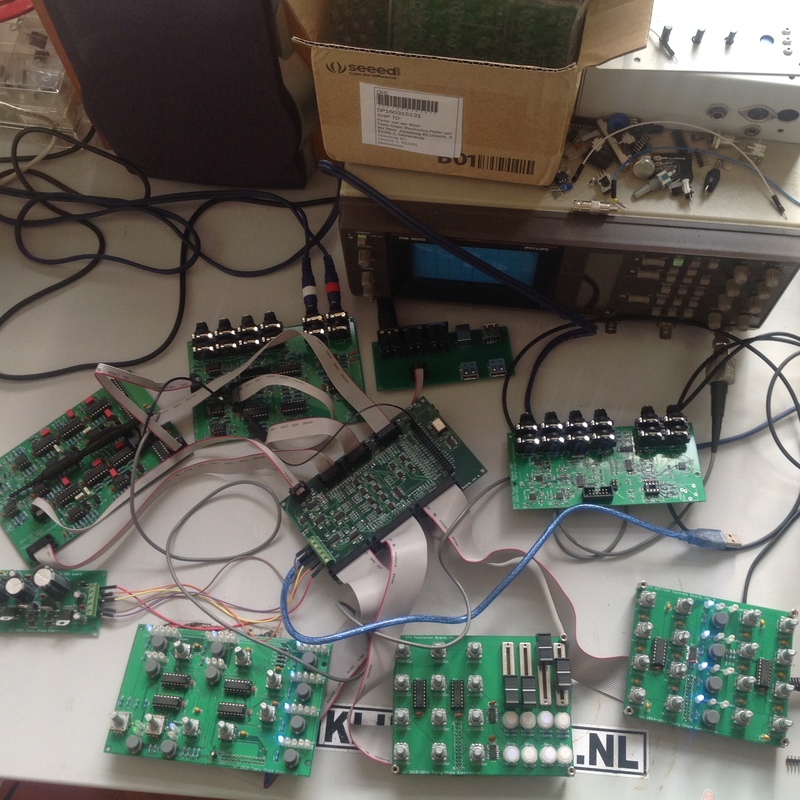 Another thing is the analog audio PCB’s. SMD is cheaper, and also saves space. 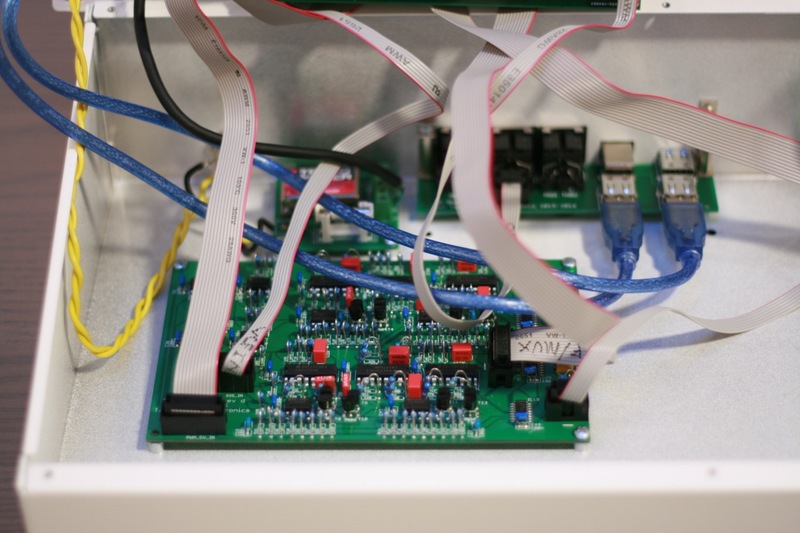 We’ve already made the VCA board into SMD, but it still needs an extra development cycle. Same for the VCF. Final silkscreen adjustments for the DIYers! Estimate we’re still on track, except for the PSU business. But early summer still sounds feasible..
First of all, 20 Sawbench rewards have now shipped out. That means all except the ones in the combined (ST4+Sawbench) rewards. The combined rewards will be sent out as soon as the ST4 is ready. This saves work and postage costs (which are very high). The webshop will start selling Sawbenches again at some point. But we’re running out of stock we’ll probably make a follow-up. Note that the mod board has got sliders for ADSR and ledbuttons to quickly select channel and function (VCO/VCA/VCF/AUX). Assembly and test will start today. As mentioned before the SMD will be 0805 and SOIC, so relatively big and hence suited for DIY. We like the SMD because it’s cheaper, smaller, and we feel easier to solder than through-hole. However, all control and interface components (pots, sliders, sockets) will remain through-hole, since this is much sturdier! Furthermore, we’ve contacted the factory for PCBA (PCB Assembly by machine).. Especially for the VCA (~100 components) and VCF boards (200+ components). Some work on the software has been done. The most glaring bugs were fixed and it seems there are no more crashes now.. But a lot of features need to be implemented, still. After some deliberation it was decided to go ahead with MIDI OUT stuff like unlimited polyphony and cc’s. However, they won’t be there in the first release. More like v1.1 or 1.2. The GUI needs to be completely redesigned (piano roll for the poly stuff and some crazy stacks for the cc’s). In recent days we also contacted a new designer to do the front plate and back panel graphics. We’re thinking of a multi-color scheme, if the budget will allow. We’ve also contacted the casing factory about this.. In closing, a lot of activities. But it looks like it’s all coming together. For all the Kickstarter backers and people interested in the ST4. Last week we sent the first rewards to the backers (first-come first-served): 5 Sawbench kits and 5 assembled ones. 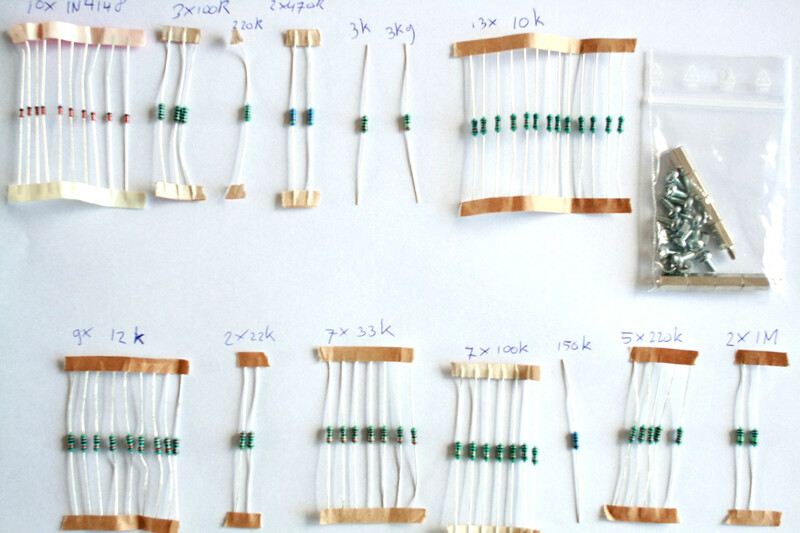 This week we made a similar amount and they will hopefully be tested and shipped over the weekend. Also, for the DIYers, the manual has been enhanced with pictures and tables, which can be used (also by us) to verify if all components are in the bags! Just overlay your stuff to check! Some good news about the ST4: the noise issues seem solved! The numbers: SNR is now better than 80 dB, in some cases better than 90 (but it should not be more than that, bleh! :)). Even better, the periodic noise issues are completely gone! The entire guts needed to be replaced (going from PWM CV to a multi-channel DAC), but it was worth it. The envelope section has been redesigned and the new components are already in-house. 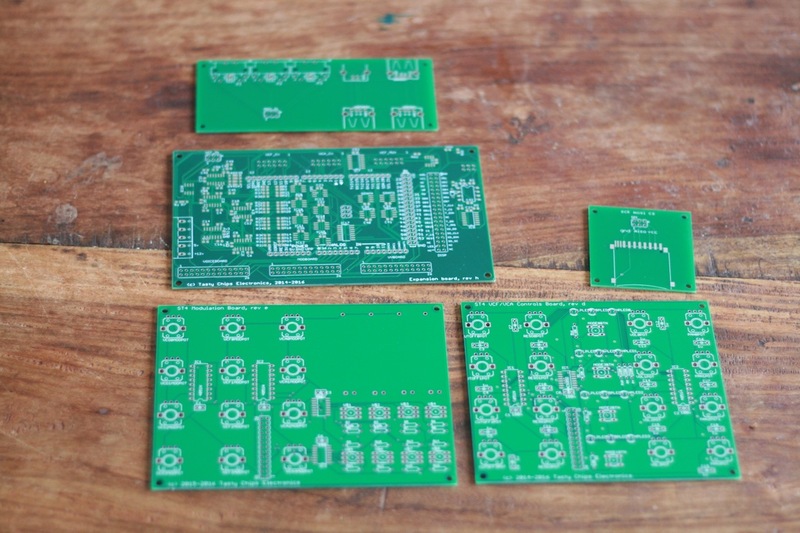 The new design for the control PCB’s (with envelope controls and such) is almost ready to be taped out. We hope to send those off to the factory in the next week. The new multi-channel CV DAC design will also be taped out at the same time. 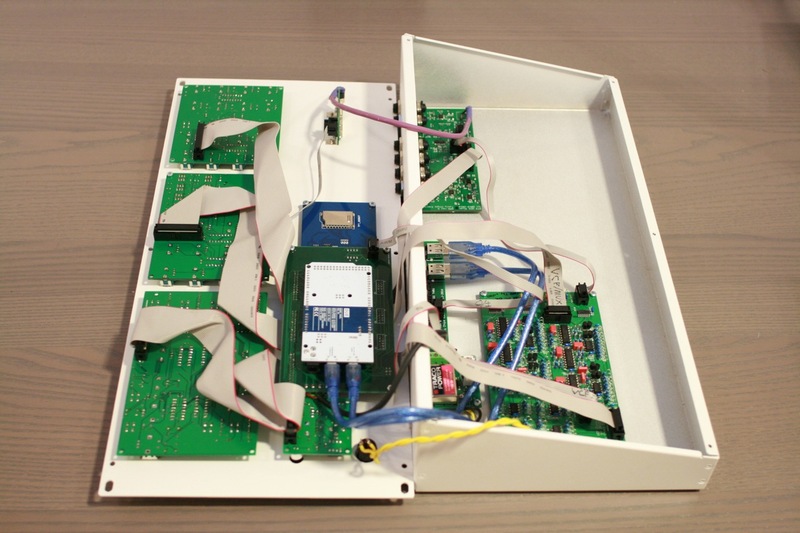 When the new control board design is finalized we can also start redesign of the new front plate and contact the factory. We’re currently in discussion with a potential US distributor. Overall, things seem to be ahead of schedule. We expect to send out all the rewards early summer.